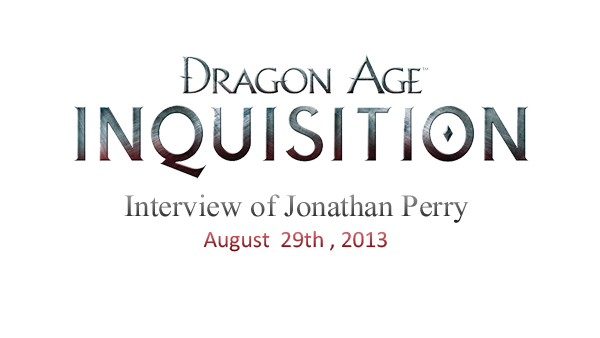 Interview of Jonathan Perry | Dragon Age Saga : retrouvez toute l'actualité des jeux Dragon Age de Bioware! 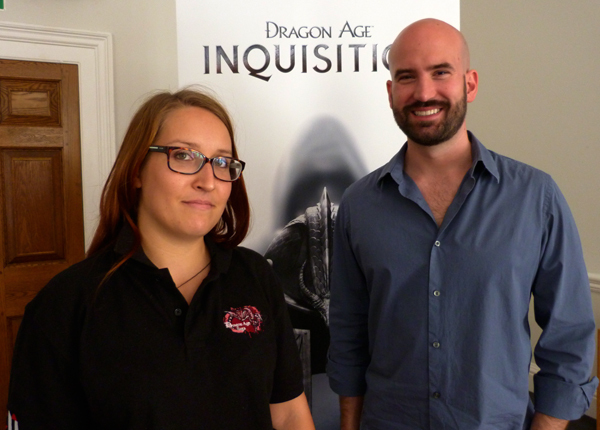 During the London Event , we had the pleasure to met Jonathan Perry, the cinematic director of Dragon Age Inquisition, and ask him a lot of questions about it. Cette interview est aussi disponible en français! 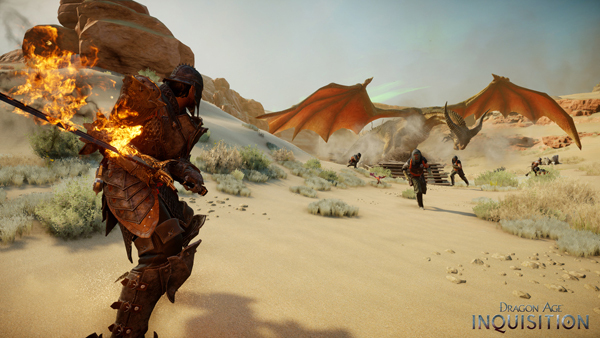 Dragon Age Saga :Jonathan Perry you're the cinematic director of Dragon Age Inquistion, could you explain to our readers what's your job at Bioware ? Jonathan Perry : - I work pretty closely with the art director and lead designer and lead writter. We focus on a story we want to tell and how we're going to tell that story visually through the cinematics, so I work with a team of cinematic designers and cinematic animators and together we create all of the interactive cut-scenes and conversations in the game. Before working as a cinematic director on DAI, what was your previous works at Bioware and other companies ? - At Bioware, I started off as a cinematic designer, I worked on Mass Effect 1 & 2 and all the Dragon Age games, and then I started as the lead cinematic designer on DA2 and now I work as a cinematic director on DAI. Before that I made some interactive flash games, I did a lot of playing around with that, making short films inside of a video game engine.So I had a background in film and happily able to apply that to cinematics now. You really know the Universe in Dragon Age I think. -There's so much out there with the books and the comics, because there's so many different ways that you can go through the conversations in all of our games. I have some questions about the presentation of this morning, what we have seen had a really nice quality, but when do you think that the press and the players/fansites will be able to test the game ? -Ah, that's a very good question, I'm not sure…I'd love to get our fans some hands on time with the game, but It would be in a future gaming event, unfortunately I don't know what the plans are. -The maps looked very big in the presentation, how much bigger than DA:O maps ? -Significantly bigger than DA:O maps ! One thing that I have to say is that, first of all the level we saw, and second level as well, both of those were what we consider kind of medium sized levels, but each of those maps by themselves are bigger than all the levels of Dragon Age 2 if you were to put them together. So they're very very big. The new technology has allowed us to make maps even bigger than we've ever made in any of Bioware games, and we have many of those maps, and many of them much bigger. -What kind of environments and country are we going to see in the game ? - Good question, unfortunately I can't go in too much details, you guys will be able to see a lot more than we've shown previously, I know Mark Darrah our executive producer has confirmed that we will be travelling this area between Orlais and Ferelden and part of what we wanted to do was instead of giving you just one big area to explore we wanted to give you several big areas that were spread accross the world of Thedas. You'll be travelling to several locations, you'll have a big variety of locations, you'll have these bogs full of corpses, these frosty icy moutain tops perhaps in the Frostback, or southwestern the deserts of the Western Approach, and even more, lots of rainforest and jungle, and lots of other . Unfortunately we can't give details. -I saw an enemy that I didn't know in the video, it's a red templar, I've never seen that before, could you explain what they are ? -That's a good question, well they're templars and something happened to them, but unfortunately we can't go into story details about how they became that way. - Like Meredith in Dragon Age 2, or something like that ? -Hmmm, maybe, they did have some kind of red glowy crystal, that might have corrupted them somehow. -The choices that players have made in Dragon Age Origins and DA2, are really importants to the players and really importants to us. 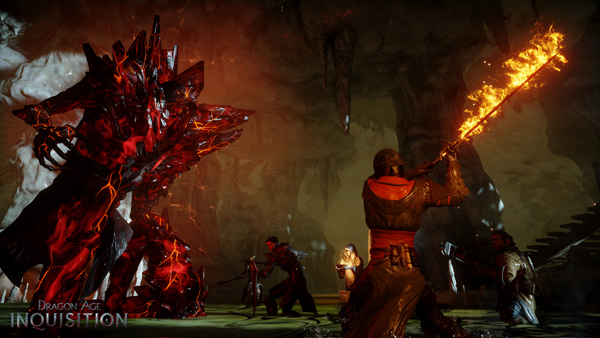 We do want to react to those choices that you've made, so we'll react to them in Dragon Age Inquisition. We certainly pay attention to who the fans' love when it comes to the followers, and as much as possible we try to bring them back. We've already shown that Varric's back, Cassandra's back, there will be many more returning characters but unfortunately we can't confirm which one those are yet, we do hope to provide you more informations soon. -Can you tell us what happens to Hawke and the Warden ? - Oh, the Warden could be dead…We certainly, again, want to react to those decisions that you've made and how they shaped the world of Thedas. We had planned an additionnal DLC for DA2. Many fans felt like because we shifted our attention to DAI, that we left Hawke's story unresolved so that's something we're aware of and I think we will be looking for a way to let the player know what became of Hawke and the warden. -Morrigan's child must be grown up by now, and we saw her at the trailer at E3, will we see her child too ? My Warden's was the father so I really would like to know! - Unfortunately I can't answer, it's something people have been really curious about, it's something that could possibly come up, but we can't confirm any details. -Who will our be companions ? I saw Cassandra and Varric, and the new character Vivienne, are there other characters that we have met in previous games, books or comics ? - It's possible, we can't confirm any of those at this point, I'd love to talk about who else will be joining your adventure because we have a lot of really cool followers lined up, ones I think fans will be really excited about but we can't go into details. -Who is exactly Flemeth, she can't be just a witch, she must be really important , she knows everything. -Yeah, I can't go into details about her history, there's a lot of really interesting material there, she keeps popping up, we can't really say, but over the course of the Dragon Age games, we'll never know what she trully is. -About the gameplay, we know the inquisitor will ride on a horse to travel through Thedas, are there different kinds of horse, can we ride dragons, or other creatures? -At this point horse are the only mounts that we have confirmed, I wish I could tell you more. -How will the dialog and romance system work in DAI, what will be the new caracteristics of romances and dialogs ? - I think the way we'll handle relationships with the followers and potential romances and things like that will be very similar to the previous games. Unfortunately we can't talk about who you can romance and how you romance them, cause I know we've had different systems, like kind of approval systems, in DA:O you could give gifts. We really aren't able to talk about exactly how the relationships will work, but as in the previous games they will react to your decisions. As you Varric is very upset with what you chose to do as opposed to helping the villagers so that's really impacted his relationship with you and that may have other consequences with your relationship with him. -Does your class have an impact on other NPCs' actions ? -Your choice of race and class, we'll try to react to that as much as we can, wether it's through content or through the way characters talk to you, there may be some content that you would get as you know, one class or one race, that you might not get as an other class/race, but unfortunately I can't get go in too much details we want to create a unique experience for you based on how you build your character. -Is DAI the conclusion of the saga, or do you have some ideas for what will follow ? - Mass Effect was always kind of going to be a trilogy, but we never planned out Dragon Age, there's so much of Thedas that we still have left to explore, and I know from talking to D.Peter there's a lot of story that , I don't see this being the conclusion of Dragon Age. 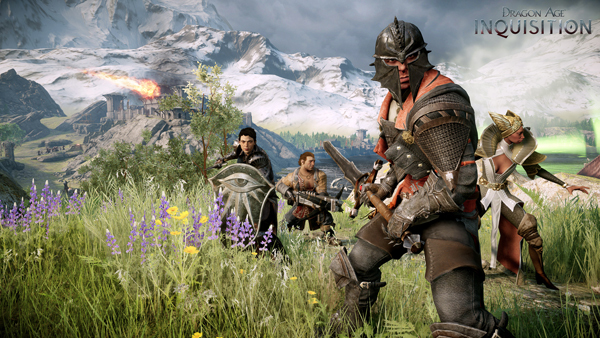 - Do you have a projects for a multiplayer mode for DAI ? - Lots of people have asked about it, we were really impressed with the guys on Mass Effect but we haven't really talked about any plans or any features for a multiplayer mode in DAI at this point. Interview for Dragon Age Saga by Gilthonniel.